Case: The ad in the local paper said, “Free dinner at Bonefish Grill and a discussion on how to survive in today’s economy”. An elderly couple noticed this ad and figured why not get a free dinner and possibly learn something useful? The ad further stated that it was a, “free no obligation tax and investment seminar” put on by an agent. The couple attended the dinner and found the seminar intriguing and the agent very persuasive. They decided to make an appointment with the agent to find out more. The husband, a conservative investor, eventually purchased seven annuities and a life policy based on the agent's recommendations. Three years later, the husband passed away. Within just a few days after the death, the agent contacted the widow stating he would have to make “some changes” to the annuities due to her husband’s passing. These so-called “changes” in the investments included closing out two annuities in her husband’s name and purchasing new annuities in her name. The lump sum distribution from the closed out annuities caused over $30,000 in penalties and surrender charges. The agent had neglected to explain that a better option available to the widow would be a simple ownership change made to the existing annuities, no transfers or losses would be necessary. The agent put earning a commission above the needs of his client. Disposition: Fined $10,000; required to complete three hours of continuing education in ethics training. The senior victim obtained a monetary judgment against the agent. Case: A four-count Administrative Complaint filed against a health agent alleged that he aided or represented an unauthorized insurer, Association of Independent Managers (AIM) also known as Chief Executive Officers Club (CEO), resulting in unpaid medical claims incurred by ten Florida consumers, and that he used funds he received for the nonexistent insurance productsas as if they were commissions. Disposition: License revoked; required to make restitution on funds he received for uninsured plans; required to pay valid unpaid claims of those consumers listed in the Administrative Complaint. Case: A title agent, vice president and agent in charge for a title insurance agency, conducted numerous real estate closings in which she overcharged for regulated fees and failed to refund the overpayment to the appropriate party. On three real estate closings, she charged for real estate taxes that were not outstanding. She misappropriated escrow funds by purchasing official checks from escrow accounts, endorsing those checks with the phrase "not used for intended purpose", then depositing the funds into the operating account of the title agency. She failed to return the funds that were collected for the real estate taxes and left those funds within the operating account of the agency. Disposition: License revoked. 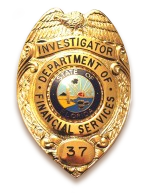 She was arrested by the Division of Insurance Fraud and charged with felony misappropriation of escrow funds. Case: A life, health and variable annuity agent submitted 18 fraudulent insurance applications using fictitious identities and submitted automatic bank draft authorization forms to the company without the knowledge or consent of the insured. By doing so, she misappropriated over $13,750 from the company by receiving commissions for the fraudulent applications. Disposition: License revoked. She was arrested for grand theft, sentenced to probation, and was ordered to pay restitution to the company in the amount of $13,750.49. Case: A bail bond agent, according to his surety company, failed to submit collected bond premiums for bail bonds he executed and also failed to repay the surety for bail bond judgments paid to the Clerk of Court. The total amount owed to the surety was in excess of $35,000. Disposition: License suspended for 12 months; ordered to pay restitution to his surety company. Case: An investigation was opened on a supervising public adjuster and his apprentice. Consumer complaints were received on the apprentice, which revealed the public adjuster was permitting the apprentice to solicit business for his adjusting firm, without directly supervising his actions. Disposition: The apprentice surrendered his license and his application for licensure as a public adjuster was denied. The supervising public adjuster was fined $2,500; ordered to pay costs of $5,000; placed on probation for one year and is prohibited from supervising any additional public adjuster apprentices. Case: A life, health and variable annuity agent acting as a benefits representative for a transportation company, switched existing supplemental health coverage policies from the current carrier to a new carrier, without the knowledge and consent of the policyholders. Because one employee of the transportation company had cancer, benefits were denied to the employee during her treatment. The Department was able to intervene and have her original policy reinstated without a lapse in coverage. Disposition: License revoked. The agent was arrested for felony scheme to defraud.